Eastern India is home to a whole community of Chinese people who migrated there years ago. As is always the case, there was an exchange of ideas, values, traditions and...food! 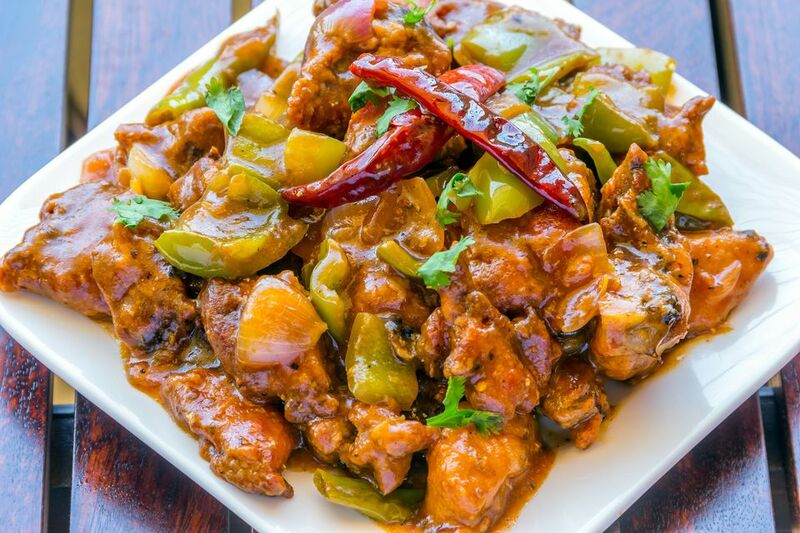 Many people in India believe there is no Chinese food like Indian Chinese food. Indian-style Chinese cooking takes popular Chinese dishes and adds simple Indian ingredients to it. Cut the chicken into 2-inch cubes and put into a large mixing bowl. Add 1 tablespoon cornflour, 1 tbsp of soy sauce and the egg to the chicken and mix well until a smooth liquid marinade is formed. Set aside for 15 to 20 minutes to marinate. Cut the onions into 1-inch pieces. If using spring onions, cut the green, leafy stems into 1-inch pieces. Place a wok or deep pan over high heat and add 2 tablespoons of oil. When hot, add the dry red chilies and cut onions and fry until the onions are translucent. Add the garlic and ginger and fry for 1 minute. Add the remaining soy sauce and tomato ketchup. Stir often and fry for another minute. Remove from heat and set aside. Put another wok or deep pan onto the stove over high heat. Add the remaining cooking oil and when hot, fry a little of the marinated chicken at a time until it is golden. Remove from oil with a slotted spoon and put straight into the pan with the onion-garlic-sauce mixture. Repeat with the remaining chicken. Once all the chicken is done, return the sauce with the chicken to high heat and stir. Cook for 3 to 4 minutes. Add 2 cups of hot water and cook until chicken is tender and done, about 5 to 7 minutes. Add the green bell peppers, and while they are cooking, put the remaining tablespoon of cornflour in a cup, add 5 to 6 tablespoons of cool water and mix well until a smooth liquid is formed. Add this liquid to the pan and stir well. The gravy will thicken fairly quickly. As soon as this happens, remove the pan from the heat.